YOUR MAMAS NOTES: Late last night we heard from a favorite informant we'll call Candy Apple who snitched to Your Mama that acting duo Naomi Watts and Liev Schreiber listed their Los Angeles, CA love nest with an asking price of $5,995,000. The unmarried couple, who live in sin and made a couple of shorties out of wedlock, seem well suited for each other having both been raised in less than perfect circumstances by wildly eccentric, bohemian, and not entirely stable single mothers. Liev's mother hauled him around from ashram to ashram until they finally settled into a cold water tenement on the Lower East Side of Manhattan and Naomi's mother toted her all around England and Wales until decamping for Australia when she was fourteen. She, now an Oscar nominated movie star (Mulholland Drive, The Ring film franchise, 21 Grams, I ♥ Huckabees) got her start in Australian sitcoms and soap stories. He's a proper Tony Award winning thespian (for Glengarry Glen Ross) with a masters from the Yale School of Drama who has done a lot of indie films but is best known for unintellectual but high grossing movies including the Scream franchise, Defiance, X-Men Origins: Wolverine, and Salt with Earth Goddess Super Mommy Angelina Jolie. Together they are a low-key couple with a high profile life and scads of famous friends including Nicole Kidman, Benicio del Toro, Simon Baker, and Isla Fisher and Sacha Baron Cohen. In June of 2004, just a month or two after she and accidentally over-dosed actor Heath Ledger busted up and less than a year before she hooked up with and hitched her wagon to Liev Schreiber, Miss Watts forked over $4,205,000 for a pedigreed property in Los Angeles' Brentwood area. The seller of the modern take on a Provençal villa was iconic Academy Award winning actress and Boniva shill Sally Field who owned the property since at least 1993. Property records show that the Watts-Schreiber residence, gated and privately situated on a quiet cul-de-sace despite its close quarters with neighboring properties, measures 4,410 square feet and listing information shows the two story house includes a total of 6 bedrooms and 4.5 poopers divided between a main house and a two-story guest house with home fitness facilities. A tile roofed two car garage and a tall privacy wall are just about all that is visible from the street where a secured entry gate opens into a verdant tree shaded courtyard with a patch of grass criss-crossed by amoebic stepping stones. The entire front facade, punctuated by a series of large windows and French doors, is completely covered with ivy that gives the updated and upgraded residence a kind of European permanence, iffin y'all know what we mean. The completely rehabbed house includes a formal living room with fireplace, a media room/den and a family room open to the eat-in kitchen and breakfast area. The eclectic and low-key personalities of the couple pop in the formal dining room where a trio of French doors left blessedly without curtains open into the front courtyard and simple sisal rug sits on a travertine (or maybe it's limestone) tile floor. Sepia toned and black and white photographs–presumably of the couple's two tots–are paired with a crisp, clean lined dark wood table surrounded by ten deck-style chairs covered in a patchwork of kente cloth. Your Mama would have suggested, nay demanded, that unless there was some sort of sentimental attachment to the puny antique crystal chandelier that it be replaced with something either in the same glittery vein only larger, with something sleek and very simple–perhaps even a couple of inexpensive Chinese paper shades–or with the capiz shell orb hanging over the table in the breakfast room. The nearby wide galley kitchen has dark, flat fronted wooden lower cabinets and a single open shelf that runs along the wall on either side of the range top. It really chaps Your Mama's hide that whomever did up this kitchen left a disturbing gap between the stainless steel back splash behind the range and the venting hood. The kitchen also has twin side by side refrigerator and freezers, double wall ovens and a butcher block work island of the sort that can be bought cheaply and most restaurant supply stores. The sizable second floor master suite looks out over the downward sloping back yard and across the canyon and includes glossy chocolate colored hardwood floors, fireplace, vaulted ceiling, scads of windows including French doors that open to a narrow balcony, a private office area, and a warmly contemporary private pooper with concrete floors, built in cabinets for linens and terlitries, and separate soaking but and tile lined shower cubby with frameless glass door. Many of the downstairs rooms open through French doors to the backyard that steps down the hillside with like rice paddy fields. The top level includes a small grassy area perfect for the couple's pooch Chicken to do his potty bizness, a tree shaded dining terrace and an outdoor living room area shaded by a trellis woven with a thick thatch of vines. The next level down is where the swimming and circular spa are located. Your Mama notes and appreciates the unique and stylish manner in which the entry steps into the swimming pool wrap around both sides of the spa. If the pool were larger it is the sort of thing that Esther Williams could do wonders with. Below the swimming pool a couple of planted terraces cascade down to a flat lawn area perfect for exercising the pooches or the youngins'. Miss Watts and Mister Schreiber have longed maintained digs in downtown New York City. In 2007 the couple was reported to have shelled out $6,050,000 for two adjacent apartments totaling about 2,900 square feet at the improbably slender 60-story blue-glass One Madison Park building. But alas, like so many other famous folks the couple quickly caught a case of the fickle and in late 2008 the apartments were both back on the market for a combined price of $7,675,000. According to the peeps at Street Easy, both of the units were taken off the market and were in contract as of December of 2009. It does not, however, appear that the contracts have been fully consummated, a situation likely to be a result of the deep financial peril of the building's developers who have had dozens of mechanics liens filed on behalf of unpaid contractors. Although it seems the ownership of the two units at One Madison Park remain hanging precariously in the balance, the couple long ago set their real estate sights elsewhere. In late 2009 the pair were spotted hunting for new downtown digs, peeping posh properties at the Sugar Warehouse and the Pearline Soap Factory buildings in TriBeCa and the Lifesaver Lofts, a converted candy factory in Chelsea. The couple also spends a lot of time in the Hamptons where they reportedly have a house in Amagansett but honestly chickens we don't find any record of that so we're guessing they rent or shack up with rich friends. But then again, what does Your Mama know about anything, really? I could move in tomorrow and feel right at home. Truly exhaustive reportage. Might you have an iPhone or iPad app in the works so we can be mobile with our Mama? one of the nicest homes we've seen here in a long time....I like it! I really like it! Mama: Do you really believe the nice-think story that Ledger's overdose was an "accident"? I don't. "...made a couple of shorties out of wedlock..."
Sounds so much nicer than being born on the "wrong side of the blanket..."
Y'all know how I feel about these cramped SoCal lots, especially in areas like the densely built Helenas; given that, this house does make good use of limited resources. And amazingly, the rear façade has a somewhat unobstructed, albeit narrow, view too. The decor is comfortable but safe, with the dearth of books an unexpected letdown (the few shown seem to be for display only ––– one would think such an interesting couple read more). "But then again, what does Your Mama know about anything, really?" Come now Mama ––– even the egotistical FLLW used to say "I rather be accused of honest arrogance than false humility..."
You never sell us short; don't do it to yourself! @lil' gay boy The rule is: picture books in the LA home, word books in the NYC home. BTW a few yrs ago we saw Glengarry Glen Ross with Alan Alda, Jeffrey Tambor, Liev Schreiber, et al. For once I wanted to hang out and collect autographs afterward. Alda didn't come out but most of the others did. When Liev signed my program he looked into my eyes, and his hand brushed my finger. Grrrreoww! Great technique. Love the home, except for the kitchen. The pool and yard look lovely. 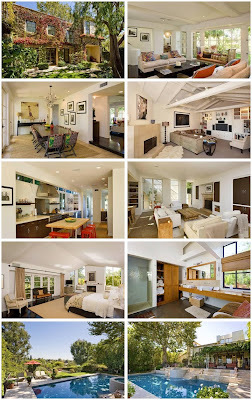 The best celeb house is Hilary Duff, recently the photos were shown, awesome!